The canine division of the A.O.F.B. , the Amiable Order of Faithful BowWows, had their own dog collars and screed. The dog collar was fashioned in silver and the screed printed on a silver metallic paper. 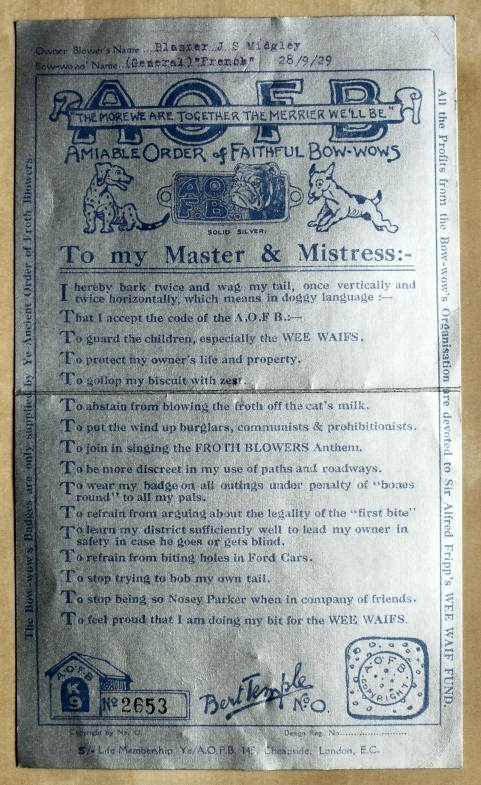 Dog collar and screed of General French, Faithful BowWow of Blaster J Midgley of the Midgley Vat , Adelaide , South Africa. Note that the screed issue number is 2653, issued 28/09/1929. It is safe to assume that as there were approximately 650,000 A.O.F.B. 's by this date, that there were probably less than 3,000 ( guestimate ) dog collars purchased in total.